It’s time to get your grill master on! (SPOT.ph) Before we talk about Gyu-Kaku, let's first talk about the two restaurants flanking it. You may have heard of them: one, IHOP, is fronted by long lines, and the other, P.F. Chang's, by huge horses. They're world-famous, they're well-liked, and despite opening within months of each other, they're consistently packing the customers in. If you're managing those chains-plus C.P.K. 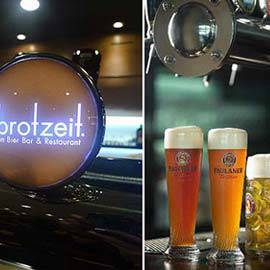 right next door-you'd think to take a breather and rest on your resto laurels for a while. Not these guys, though. Gyu-Kaku opened to the public on April 5...thereby ensuring that the sidewalk fronting the W Global Center in Bonifacio High Street remains the most packed piece of eating-out real estate in the metro. Like IHOP and P.F. 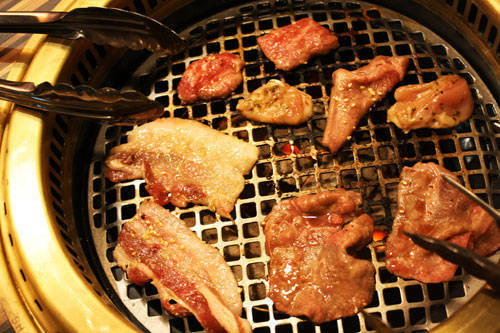 Chang's, Gyu-Kaku is a huge household name in its home territory. With over 800 branches in Japan alone, it's a favorite of college students and working types jonesing for a barbecue fix with a fusion mix. 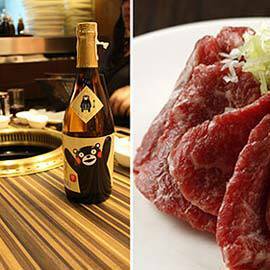 With its expansion to the United States and Southeast Asia, it's become the official biggest yakiniku restaurant chain in the world. "Other than the high quality-we get our ingredients from all over the world-I think what sets Gyu-Kaku apart is its service," says Manuel Zubiri, who helps manage the restaurant. "Other barbecue places, they put the charcoal in, they put the plates, they put the food, then they disappear. Here, they're always at your service." Upon entering, the service staff loudly makes their presence known, enthusiastically greeting you with a booming "IRASSHAIMASE!" When the neatly glowing cylinders of charcoal come to your table, a waiter shouts, "CHARCOAL COMING!" to which the others respond, "HAI, YOROKONDE!" Upon leaving the restaurant, you get a hearty "ARIGATŌ GOZAIMASHITA!" Yes, they do say everything in all caps. 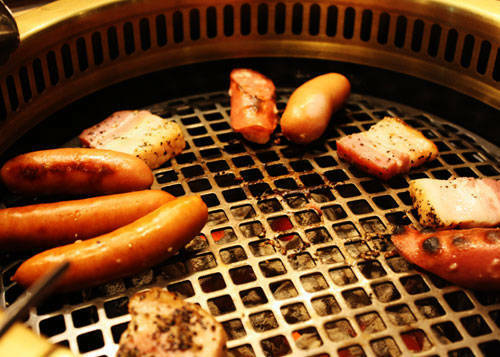 They're especially helpful when it comes to grilling the yakiniku as well. Some helpful tips we picked up: always place your meat along the outer rim of the smokeless grill, as the center is too hot. Do not press on the meat while it's cooking, as it will make the juices go out. Never flip the meat more than three times. Other than those pointers, though, we were left with CFO Griffith Go's advice, "Just have fun while cooking." For grill starters, we were served Assorted Bacon & Sausage (P245), which we cooked to a crisp, especially with the sumptious, thick slices of bacon. For the main course, we had a platter with four kinds of meat: Chicken Thigh Fillet Basil (P125 small/P165 large), Beef Tongue with Shiyo Marinade (P280/P350), Buta Karubi (Pork Belly) with Garlic Marinade (P135/P175), and Beef Karubi (Short Ribs) with Tare Marinade (P425/495). 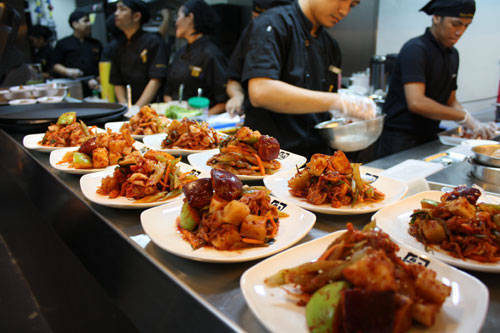 Note that each order can be served with your choice of marinade (tare, shiyo, miso, spicy miso, teriyaki, or garlic). Clockwise from top: Beef Karubi, Chicken Thigh Fillet, Beef Tongue, and Buta Karubi. 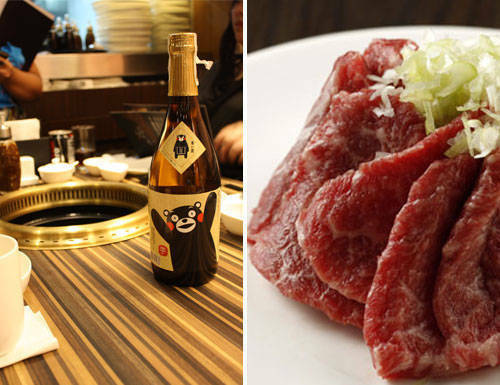 Of course, your mileage with yakiniku depends on how well you cook your own food. Still, the Beef Karubi quickly justified its price tag-thanks to its sweet, marbled texture, even a light searing goes a long way. We were also partial to the Beef Tongue. Thinly sliced, it grilled quickly (perfect for the hungry and/or impatient), and had a meaty, chewy, and robust flavor. We paired our grill-it-yourself "masterpieces" with an Ishiyaki Mentaiko (P195), a rice bowl topped with salmon, cod roe, greens, and shredded seaweed. Served in a sizzling hot stone bowl, we let the rice cook a while to get an unbeatable tutong crunch, as recommended by everyone from management all the way down to wait staff. 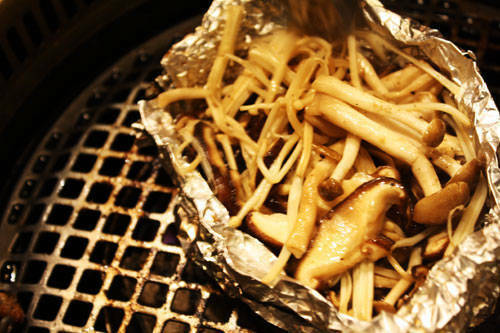 An unexpectedly winning dish was the Assorted Mushrooms (P225), a foil-wrapped package of shiitake, enoki, and shimeji. 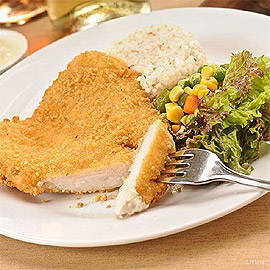 Grilled for five minutes, the steaming, piping hot result was a rich, flavorful concoction, both winey and irresistible. With dishes like these, don't be surprised to find long queues, IHOP-style, in front Gyu-Kaku over the next couple of weeks. Don't say we didn't warn you.